Lionel “Super O” track combines the realistic appearance of two-rail railroad track with the superior performance of the “three-rail” electrical system. 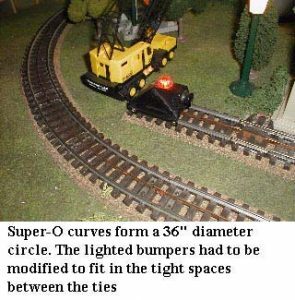 Most all postwar Lionel cars and locomotives will operate efficiently on “Super O” Track. 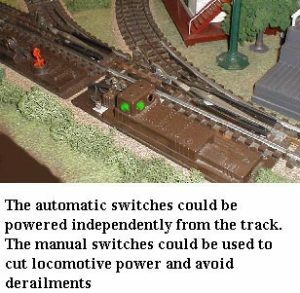 Through the use of various transition pieces, described at the end of this article, “Super O” Track can be combined with “O” and “O27” switches and crossings making it possible to convert to “Super O” gradually without discarding or obsolescing older Lionel equipment. Lionel was at its postwar best in consumer interest as well as quality of product during the late 1940s and into the early 1950s. Like every other successful company, Lionel was always looking towards the future to be certain their products would meet their consumers’ future needs. 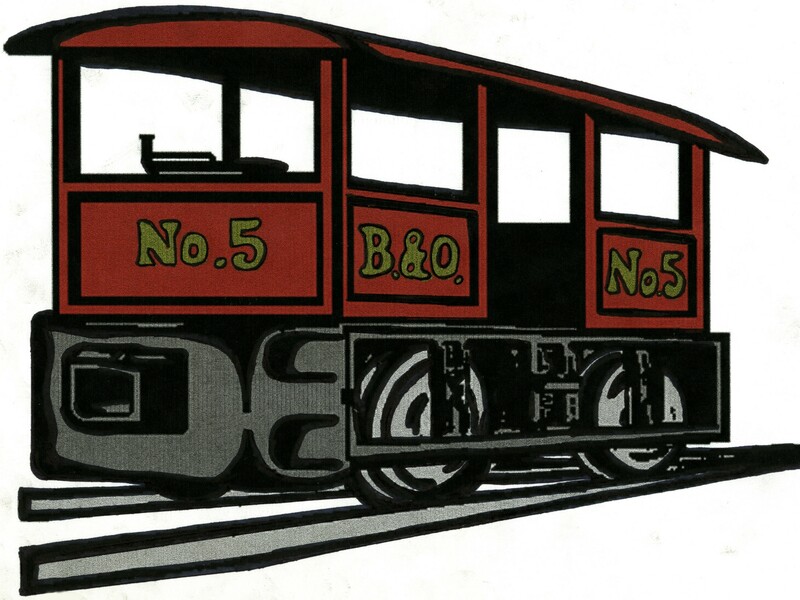 As the 50s progressed, however, there was a definite sagging of interest in their O and O27 gauge toy trains. HO trains were quickly becoming the leading model railroad gauge in America. HO track used two rails, while Lionel used three, and the ties of HO track were much more realistic-looking. Lionel was quite concerned as sales and profits dropped. They searched for fresh ideas to rekindle interest in their toy trains. They reviewed and tried many ideas. One major effort was to develop a new track system. This was the start of Super-O track. 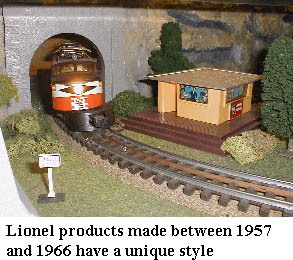 Let me tell you about Lionel Super-O track and try to spur your imagination back to 1957 when it was introduced for sale as well as in the new Lionel Showroom layout. During the mid-fifties the space program and many new technological changes were occurring within the United States. Interest in Lionel trains was dramatically on the wane. Lionel sales were plummeting. Electric race car sets, HO scale trains, space programs, chemistry sets, plastic models (of cars, planes, boats, etc.) and many other venues were taking away from Lionel’s sales. Lionel needed to come up with something to try and reinvigorate the interest of the train buying public. One area that provided an opportunity for improvement was the unrealistic appearance of their 3-rail tinplate track system. 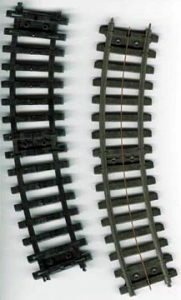 Lionel had long been subject to criticism for the “toy like” appearance of their 3-rail track compared to their main competitor, American Flyer, who had 2-rail track. 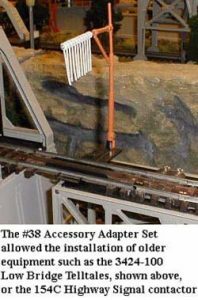 There was no way Lionel could switch to 2-rail but they made a valiant attempt to provide a much more realistic looking track system. Super-O was introduced in 1957 and was available for sale through 1966. Super-O would continue to offer the main 3-rail advantage (ease of hook-ups for reversing loops) and be “scale like” in appearance. 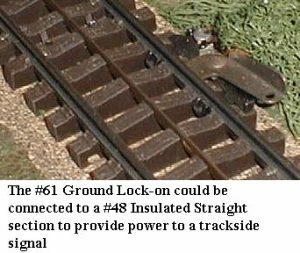 With its multitude of highly detailed dark brown railroad ties (16 per 9 1/2″ straight track section compared to three for traditional tubular track) which included a wood grain appearance, simulated track plates and spikes plus a realistic flat “T” profiled rail Super-O was very strong on realism. Ordinary O gauge track has 3 identical tubular rails. In addition to replacing the outside tubular rails with “T” rails, the inside third rail of Super-O track was replaced with an “invisible” third rail made of copper that provided a most attractive alternative to traditional tubular track. Not to mention, that if it caught on, Super-O would spur a whole new group of purchases and interests for their new track and hopefully revitalize interest in their trains. Due to the small size and unique shape of the rails, thin strips of copper were used as track pins. The plastic ties were designed to lock sections together. The middle rails used clips which were pressed on top of two joining rails. This method required operators to occasionally inspect the track bed and make sure no clips were slipping off from the rollers moving over them. 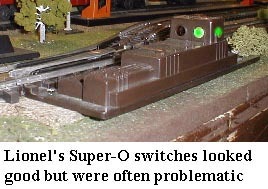 Super-O was a creative attempt to rekindle interest in Lionel trains. 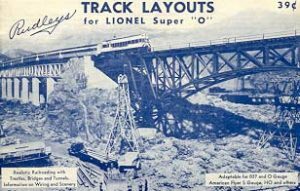 Lionel advertised that Super-O would enhance Magne-Traction due to the flat surface of the rails compared to the curved surface of O27 and O gauge track. 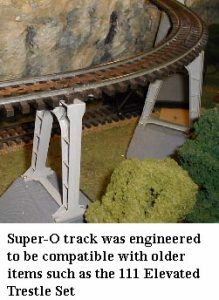 The track system was made available with a complete package of components that included conversion pins so Super-O could connect to O27 and O gauge tubular track. Not all Super-O items were produced throughout the 1957 to 1966 time span. As you probably know, the system never had the desired effect of stimulating the type of interest for which Lionel had hoped. It seems if Lionel would have elected to produce 54″ and 72″ diameter track and switches it might have helped but that probably was not the answer either. Super-O was last offered in 1966, as Lionel cut back on all areas of train production. Super-O’s time had come and gone as it slowly disappeared from the market. Ok, ok…….the question is: Does Lionel have the tooling for Super-0 or not? Wasn’t it scrapped years ago? Could Lionel reissue Super-0? Would they? Well, I would never be the one to perpetuate controversy but here is what I am led to understand from those who seem to have some insight into this situation. In the first place it was the common impression from “insiders” at Lionel, several years ago, that all the tooling for Super-0 had been scrapped. At that time, I had this verified from a rather high level Lionel (since retired) employee. Well so much for the validity of that information, at least in totality. All the sudden, however, I know 3 individuals who say the tooling still exists! Now, what does that mean? Is it just for curves and straights? All items including switches? Or what? Well, I do not know the answer to all but take a look at this picture. What you are looking at is a sample (left side of picture) of Super-0 track (ties and road bed only) that has been shot in 1999 / 2000 compared to a regular Super-O curved section. As you can see it is a curved section and black instead of traditional brown. I am also lead to believe that there are some straights shots that have been produced in white. Apparently Lionel was testing to determine the tooling’s performance. Does the tooling still operate properly? The test appears to have been successful. Those who have the roadbed samples say it looks great. Many, many questions still exist about what other tooling exists and if Lionel would ever produce Super-0 track again. Certainly, the switches would present a formidable challenge as they work fine but can be fragile. What about the Super-0 rail? If you remember, years ago Lionel made a flat car (#6805 from 1958, 59 and reissued in 1980 as #9234) that carried lit radioactive canisters. If you carefully think back, electricity to the canisters was carried thru Super-0 rails. So, up until 1980 Lionel either had left over rail stock or capabilities to produce or procure rail stock. From several conversations with those who seem to have inside information and from conversations with some Lionel people who did not add much, I can say that it appears that Lionel still has the capability to produce “at least” curves and straights. Now, what do they do about #31-7 bus bars? What do they do about #31-15 steel coupling pins that must be used to join the track? What about ALL the other Super-0 parts? The rumor was that Lionel was “considering” making a one time run of Super-0 track. No idea, really, when or if this is, or ever was true but………”IF” Lionel wanted to produce Super-O just to satisfy the pent up demand for curves and straights they certainly could. Is the market large enough? How much can we actually buy? Would it justify recovery of costs and a profit? 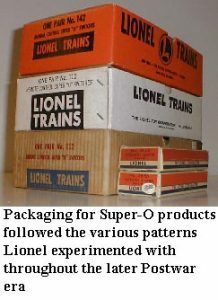 Anyway, not that long ago the Coil Couplers of America (www.coilcouplers.com) ran an article on what ideas us train people would like to see and the most popular suggestion was for Lionel to reissue Super-O track. Today there are a plethora of track systems on the market. Never have there been more track systems for O27 and O gauge trains. One of the advantages that Super-O offers is that it still provides maximum effect for Magne-Traction locomotives due to the flat surface of the steel rail. 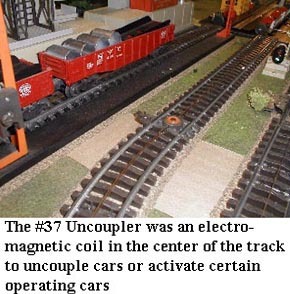 Many modern scale detailed track systems are not ferromagnetic, making Magne-Traction ineffective. Super-O is also now available in the secondary market custom fitted to any desired diameter. Of course, the switches remain 36″ diameter (measured center rail to center rail). Also worthy of note is an exquisite 24 page booklet that was produced during 1962 by then Lionel dealer J. L. Rudley. Not only are there 18 pages of well detailed Super-O layouts, but all layouts include track components used and their item numbers. It also includes six pages featuring scenery, accessories, and wiring. It is a fine Super-O reference book. Don’t miss it if Super-O is your interest. Should you have further questions about Super-O track, I would be pleased to answer your e-mailed questions. I have developed an interest in this 40 year old track system and continually offer it for sale as well as continually look to purchase. I currently have an electronic mailing list, which features questions and answers about Lionel Super-O track. Always Buying and Selling Super “O” track.